Imperial Life Sciences aims to provide complete solution to various fields of research like Molecular Biology, Apoptosis, Oncology, Cell Biology, Cell Signaling, Immunology, Stem Cell Biology , Neurology through its Reagents & Consumables division by offering best in class products from some of the world’s most renowned biotech companies. 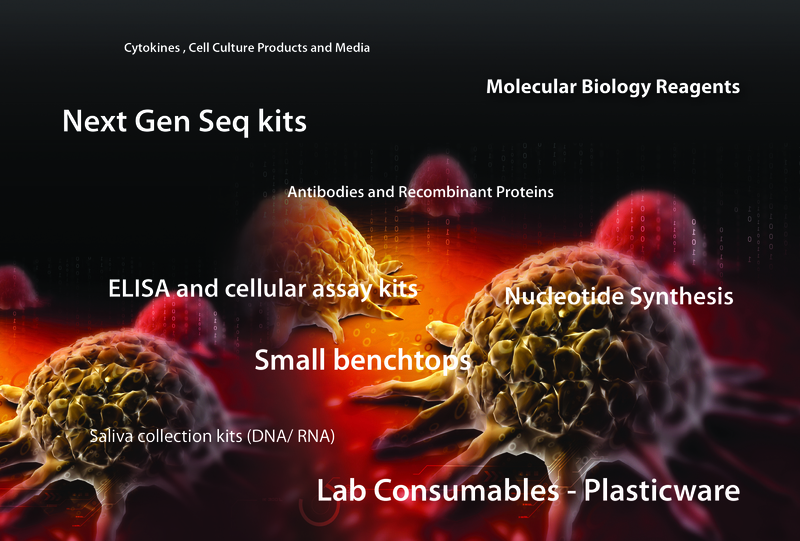 Our Reagents & Consumables Division aims to simplify the research process by providing a abundance of quality products like Restriction Enzymes, PCR polymerases, products for gene expression, cellular analysis, RNA analysis, epigenetics, protein expression at cost effective value. This division also offers primer oligos and a variety of glycobiology research tools alongside providing a selection of specialized DNA plasmids for cloning experiments. We take pride in ourselves for providing recombinant proteins, antibodies with high specificity & lot-to-lot consistency, GMP-Compliant products for Cell, Gene & Tissue Therapy, Animal Free Cytokines, ChIP kits, ELISA kits, Media Supplements. Our team is dedicated and have experience in supporting lab equipments like electrophoresis units, Mutation detection systems, PCR workstations & various small benchtop instruments for Life Science Research with tools and technologies of high quality plastic consumables, tissue culture plates, pipettes, PCR tubes & plates, micro centrifuge tubes, cryovials, other lab essentials. Our collection of Reagents/Kits/Consumables are marketed throughout the country and supports hundreds of customers in research institutes, academic labs, diagnostics laboratories, pharmaceutical industries, private companies , CROs . Our commitment is to provide superior products and quality support to today’s scientists and researchers, so that they are able to spend more time on research, than in search of products and support.